The Sonic franchise has staggered, stumbled, and down-right fallen on its face in recent years. The cast has grown out of control, the gameplay has decayed and mutated, and the level design has suffered. With each new game, players grow a little more fond of the old ones, many drawing a sharp division point at Sonic Adventure. There exists the argument that everything before it is great and everything that followed sucked. Well, it is back for the HD generation, so let’s see how it held up. One of the main selling points of the press info for this game is that it is remastered in glorious 720p. This is a tad misleading. Yes, the game is rendering at a higher resolution than it had on the Dreamcast, but lets be clear that we are talking about a port, not a tear-down remake. The models, environments, and textures are just as they had been, and even the screen ratio is a pillar-boxed 4:3. The shift to HD is the equivalent of wiping the Vaseline off of the lens and letting us see things for what they really are. And I must say, I’m sort of impressed. The characters are flat-shaded rather than textured. That’s good news. It means you aren’t looking at a low rez texture on a high rez screen. The polycount is a little low, and that shows around the edges, but for the sheer size of the game it is easily on par with many of the other titles XBLA has to offer. Level of detail and draw distance are the same as they ever were, but the level design makes it a non-issue even at the breakneck speeds Sonic musters up. The excess horsepower of the 360 thus can be spent on a rock solid framerate. Expectations for graphics have changed, but Sonic Adventure put plenty of detail and care where it matters most. Don’t get me wrong. It isn’t a current gen title and could never be confused for one. For a game first released in 1998, though, it is a lot easier on the eyes than many games its age. The game is split into six main play styles, each associated with its own character. These range from the standard all-out sprint to the finish for Sonic to treasure hunting for Knuckles and, inevitably, fishing for Big the Cat. Skills and abilities add utility to each character as they progress, allowing gameplay to evolve along the way. Everything boils down to adventure stages, action stages, and boss fights. There’s also a chao garden, which in the Dreamcast let you load a creature onto your VMU, tomagotchi style. I haven’t found any attempt to include that full functionality yet, but I went ahead and hatched a few of the critters. Their names are Destro and Todd. So far they have done very little to earn my love. As is fitting for the fastest thing alive, the main game puts a strong emphasis on velocity. If you can keep a handle on the controls, Sonic can hit some serious top speeds, and his spin dash gets you there more or less instantly. The camera can be a little bit of a pain, though. The controls assigned to moving it around are mapped to the triggers and bumpers, which isn’t immediately intuitive. Throw in the fact that, as an early 3D platformer, the developers hadn’t quite nailed down automatic camera control and you can expect to bump into a lot of walls before you get the hang of it. Since bumping into walls can stop you in your tracks and this is a game all about speed, that’s a bit of a problem. Hints on how to progress in the game are given by a disturbingly Navi-esque floating ball of light, but unlike her irritating counterpart, this glowing tutor waits until you ask for help before barking orders. You can also get info for the townspeople, who are human, despite the fact that almost the entire cast is an animal of some kind. I never understood that… Then again, Dr. Ivo “Eggman” Robotnik is human, so I guess I should have realized they were around somewhere. But I digress. Aside from the inevitable signs of an immature entry into the 3D realm, the gameplay of Sonic Adventure is still as fun as it was on Dreamcast, and it translates to the 360 just fine. The press material touts the shift to Dolby Digital for Sonic Adventure. That sounds great and all, but Sonic Adventure was made in the days prior to high quality audio. The technology may have changed to take full advantage of your new sound system, but the audio seems to be the same data as it was on the Dreamcast, so it at times seem a little flat. The music is what you’d expect from Sonic: decent, heroic, and slightly generic rock mixed with setting-appropriate tunes for the various themed areas. The worst and best part of the audio of this game is the voice work. The casting is perfect, particularly for Sonic and Robotnik, but sometimes perfect isn’t necessarily a good thing. Tails is a character that managed to get under my skin for some reason, even before he started talking. In Sonic Adventure, he sounds like Linus from the Peanuts cartoons. It is a sort of weak, vaguely annoying voice, and thus suits my interpretation of the character perfectly. And it annoys me every time he says anything. Also, the actors seem as though they were given their lines and told to say them, without any indication of context. It leads to confusing emphasis at times, but it also leads to some fantastic over-the-top performances. How can you not love a character delivering a ridiculous line with absolute conviction? This all sounds sounds negative, but it comes together into something I really like. Something about the audio quality and the hilarious vocals and dialogue brings back a feeling of nostalgia. It is almost like the sound is being just bad enough to poke fun at itself, yet just good enough not to let it get in the way of the enjoyment. In the early entries in the series, there wasn’t much of a story at all. It was just “This is Robotnik. Kill him. These are rings. Collect them. There are also chaos emeralds. Collect them too.” There wasn’t even a captured girlfriend to rescue. Sonic Adventure is thus a vast improvement. A watery fiend called Chaos is wreaking progressively greater havok, and Robotnik is after the Chaos emeralds. Each character has their own sub-story that weaves along independently. Every now and then it will cross paths with the plot of another character, slowly crafting a tapestry that forms the main story. Key moments are seen from multiple points of view as you unlock and play through each character, gradually uncovering motivations and manipulations. It isn’t up to the standards of something like Mass Effect or Bioshock, naturally, but Sonic isn’t up against them. Sonic only has to worry about Mario, and compared to the plots the plumber gets caught up it, Sonic Adventure is practically Oscar-worthy. Sonic Adventure is an old game. It represents an early step into what we now consider the standard for games. As such there are some control problems and sub-par graphics, sound, and camera. The thing is, they are only sub-par because par has changed. By modern standards, it is heavily flawed, and some will complain that the port should have addressed these flaws. If it was developed and released today, or even five years ago, I would have scored it much lower. When judged by the standards it was designed for, though, Sonic Adventure is superb. SEGA went the faithful route, simply putting the game, unchanged, on a new platform. The result is the game you remember, nothing more and nothing less. This is a situation where the nostalgia filter adds quite a few points to the score. If you liked it, you still will. If not? Hell, for $10? Get it anyway. 7.1 / 10. 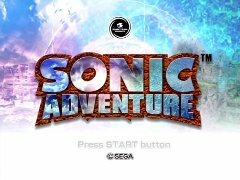 The shift to HD makes the game show its age, but Sonic Adventure remains a solid, entertaining classic, and a steal for the price.